“What use painting is to woman or man is unknown, yet it is surely necessary, as attested to by the caveman and the dandy. I have long pursued a path that avoided the health-plans and dogmas of the high-priests and the moneylenders, and yet have overthrown nothing but painterly cliches and visual platitudes. The Malthouse, formerly part of Stroud Brewery, is a formidable venue for an art exhibition. The bare rustic brick walls and vast height are no problem, however, for Pete Hoida’s central piece, ‘Poet and Peasant’, measuring a magnificent 178 x 335cm. 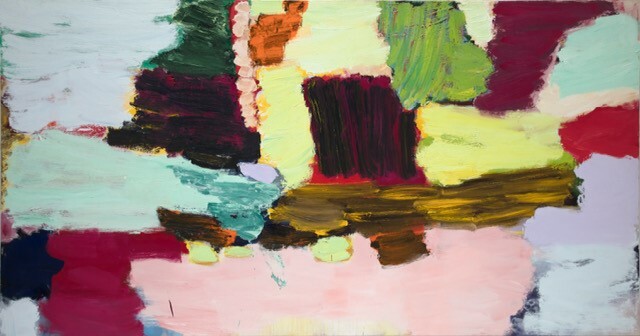 The painting completely holds its own and commands the space with its sublime passages of pastel shades in pistachio, turquoise, eau de nil, yellow and pink, offset by blocks of rich sumptuous carmine overpainted by muddy purple, smeared yellow into umber, earthy green and flashes of orange and red. Hoida allows the underpainting to show through, creating a rich surface generating space and light. Ruskin Mill, situated in a wooded Cotswold valley beside a lake, is the perfect setting for Nick Moore’s latest exhibition, ‘MATERIALSHIFT’. 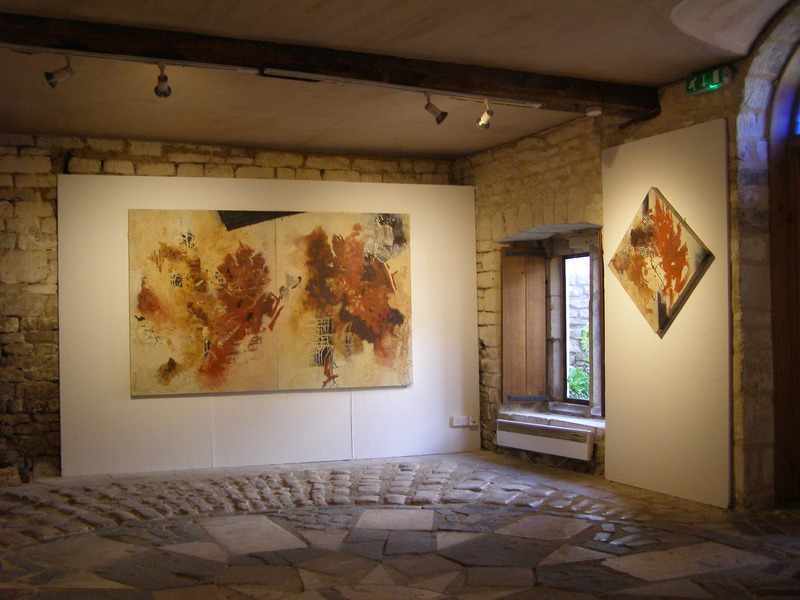 The old stone interior, with a soot laden wall scorched by a primitive open fire, reflects the elemental quality of the earthy pigments Nick uses in his paintings/collages. These works stem from a series of paintings Nick rediscovered during a recent studio move. They were discarded canvasses and different from his earlier series, ‘Dark Intervals’ (which had focused on black and burnt umber as key components), in the sense that they had a revised colour palette of buff, Payne’s grey, red ochre and burnt umber. In this new series Nick has integrated added material into the fabric of the paintings and heightened the textural experience. He has used sacking, old roofing felt, PVA mixed with either sawdust or sand, crushed charcoal and ashes mixed with acrylic colour and ink, together with various moulded cardboard remnants that have been distorted and flattened to create areas of animated surface.